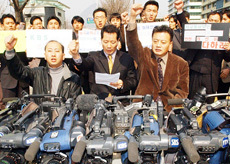 A group of Korean cameramen stage a rally in front of the U.S. Embassy in central Seoul March 9, 2004, protesting the U.S. military's recent detention of three Korean journalists in Iraq. 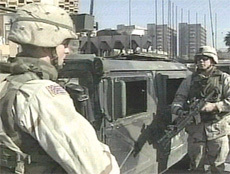 The Journalists Association of Korea (JAK) delivered a protest letter to the U.S. Embassy in Seoul March 10, 2004 over the U.S. military's recent detention of three Korean journalists in Baghdad, Iraq. In the letter, the JAK, which represents the interests of working journalists in Korea, demanded the U.S. side make an official apology over the incident and promise not to repeat similar incidents. The JAK also asked the U.S. side to make public the U.S. military's standard operation procedures on which U.S. soldiers in Baghdad were reported to have forcibly held three Korean journalists with their hands tied behind their backs. The U.S. military in Iraq detained three Korea Broadcasting System journalists for about three hours before releasing them on March 6 on suspicion of carrying explosives, according to the letter. To those demands, U.S. Embassy officials, who called at the JAK office, promised to further look into the latest "unfortunate" incident and deliver the JAK's message to the U.S. administration. They failed to make any apology over the incident, but agreed to meet again, if necessary, to further discuss the matter. Ranking JAK members were supposed to stage a protest rally in front of the U.S. Embassy to deliver the protest letter March 9, but the U.S. Embassy wanted to visit the JAK office to exchange opinions on the issue. Among the JAK members who attended the meeting were Lee Sang-ki, president of the JAK and two vice presidents Kim Gu-cheol of Korea Broadcasting System and Chung Il-yong of Yonhap News Agency, as well as Kang Seok-jae, chairman of the International Affairs Committee of the JAK. Representing the U.S. side were Don Q. Washington, minister-counselor for public affairs of the U.S. Embassy in Seoul, and Maureen E. Cormack, press attache of the U.S. Embassy. 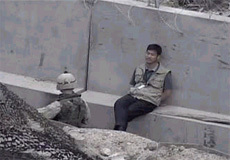 JAK officials expressed their deep regret over the U.S. military's maltreatment of three Korean journalists, saying U.S. soldiers forcibly held Korean journalists for three hours in an "inhumane" manner, even after they found no traces of explosives in their luggages and the Korean ambassador in Iraq personally guaranteed their identity. "We see the latest incident as a serious violation of basic human rights and an infringement of Korea's sovereignty as the U.S. military authorities ignored the Korean ambassador's confirmation," said Chung of Yonhap News Agency. He said, "The latest comments by the U.S. State Department have only enraged Korean journalists and we want an official, sincere apology from the U.S. side." When asked about the incident, a ranking U.S. State Department official said that "we regret inconvenience to Korea." "We came here as we wish to have open talks with you ... (the U.S. military's) standard operation procedures will be reviewed," said Washington of the U.S. Embassy. "We came here as we respect the Korean press and its view." "We expect an official apology from the U.S. administration and hope that this incident would not hurt the traditional friendly relationships between our two countries," said JAK President Lee. He also expressed hope that the two allies work together for the reconstruction of the war-ravaged Iraq. Korea is to dispatch thousands of its troops to Iraq in April this year.